Upcoming: Palm Canyon Fabric and Patterns! As you may have seen recently with Robert Kaufman's August release, I am debuting my newest collection, Palm Canyon which is available for order now and shipping in February 2018! Palm Canyon reflects the days I spent living in the Coachella Valley, baking in the warm Southern California sun. Palm trees, desert views, mountain backdrops, desert creatures, and midcentury decor. I may be a Kansas girl living in Oregon, but my highlights are all Southern California! With the release of Palm Canyon come four new patterns which will be available for order at Fall Quilt Market. The first, is Atomic Starburst. 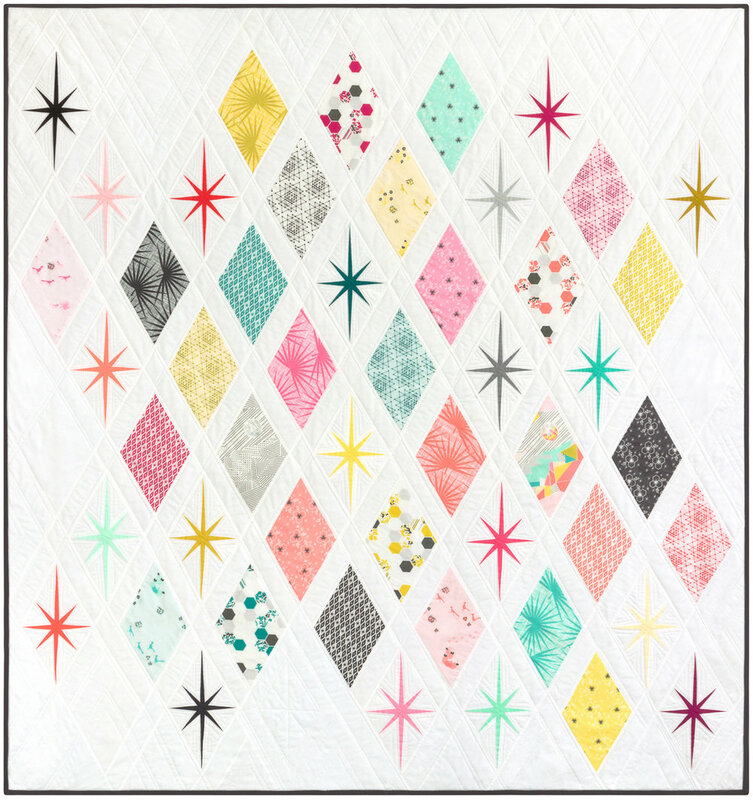 Speckled with mid century inspired paper pieced stars laid out in a modern diamond pattern. The simple, light background makes the colorful Palm Canyon fabrics and coordinates pop. Ten square friendly, this pattern was constructed with a ten square of Palm Canyon and a ten square of Kona coordinates. Orange Peels and Pinwheels is inspired by desert blooms and wind turbines. Another 10 square friendly pattern, the Orange Peels and Pinwheels were constructed with a ten square of Palm Canyon fabric. The second release in my Elevated Abstractions series, is Elevated Abstractions: Desert Mirage. Modeled after the Transverse Mountain range, it rises up from the "horizon" of the quilt like a shimmery, reflective mirage. 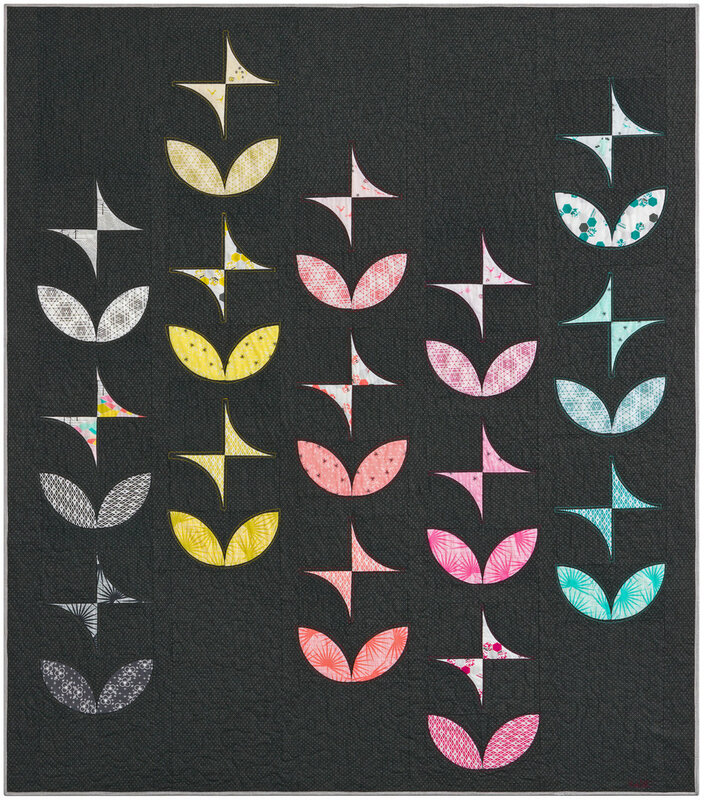 Each half of the quilt uses the warm and cool color ways from Palm Canyon and the coordinating fabric bundle. To finish the quilt, elements from my Range print have been been fussy cut and appliquéd onto the quilt. Kits are available for order now from Robert Kaufman Fabrics and will be shipping in February 2018. My newest English Paper Pieced project is the Barn Owl. One of the many owls that dwell in the desert and perch atop spiny cacti. Though, this owl prefers to pose in front of a fancy jewel shaped back drop. This owl is constructed with my Palm Canyon Fat Eighth coordinate bundle, which is a mix of Kona Cotton solids and Manchester (Yarn Dyed Cotton). I can't wait to share my newest collection with you this fall, when perhaps we will all be dreaming of the summer sun.